Diego Simeone named his expected line-up – Tiago was suspended, so Mario Suarez and Gabi played in the centre of midfield. None of the starting XI started the 2010 final. Marcelo Bielsa’s line-up was also as expected – Fernando Amorebieta was declared fit to start, although he had a poor game, caught out for all three goals. This was a pretty basic encounter – Athletic dominated possession, but Atletico took an early lead, then were content to sit deep. For the second year in a row, the Colombian striker was the key player in the Europa League final. Last year he won the competition for Porto with a fine header, but here he showed more all-round ability and constantly worked the channels well, having the beating of both Fernando Amorebieta and Javi Martinez and receiving the ball in a position where he could drive directly at goal. His stunning seventh minute strike was crucial because it set the tone for the rest of the game – until then Atletico Madrid had been pressing high up and contesting quite an open game in midfield. After that, they were able to retreat into their own half and soak up pressure, a strategy that wouldn’t have been as viable at 0-0. His second goal, a brilliant Puskassed dragback-and-fire from close range, furthered Simeone’s belief that Atletico were able to win by simply counter-attacking. So what of the tactical battle? This was fairly obvious – Atletico Madrid were 4-2-3-1, Athletic Bilbao were 4-3-3. There was a 3 v 3 in midfield, clear battles on the flanks, then each side had a spare man at the back. Atletico could match Athletic all over the pitch and be content with a safety net in defence, and Athletic struggled to play their way through. Bielsa’s side had one clear possibility to get a man past his opponent – the Ander Iturraspe versus Diego battle deep in midfield. In the semi-final against Sporting, Iturraspe did very well to shuttle past the two attacking midfielders and catch the opposition number ten out (which actually resulted in Sa Pinto replacing his number ten to bring in a more defensive option who could track Iturraspe). Diego isn’t the best player defensively, wasn’t sure whether to press the second Athletic centre-back or drop goalside of Iturraspe, and his awareness without the ball could have been tested more – but Athletic were surprisingly unwilling to bring Iturraspe forward. Athletic’s main strategy was to bring their wingers inside at the start of the game – particularly Iker Muniain, who tried to become the extra man in the middle. But their movement was a little too rushed, too frantic and involved too many players moving into the same zone. They weren’t stretching the play, with Markel Susaeta taking up very ‘obvious’ positions in the centre of the pitch. There were very few runs like those depicted in diagrams 5 and 6 here – the wingers were always moving central. The full-backs were meant to get forward and stretch the play, but the long diagonals were often wayward, and both Adrian Lopez and Arda Turan did their defensive jobs well. Simeone’s side set out in a fairly standard shape without the ball, with two banks of four featuring two very central, very deep holding players. It was rare to find either Suarez or Gabi out of position, and Athletic continually had to try and play around them as they were unable to go through them – and with their reluctance to go wide, this made things tricky. The Atletico full-backs tucked in narrow, and the wingers tracked the full-backs, then broke forward quickly to support Falcao. Adrian on the right did a good job in becoming a second striker on the few occasions that Atletico got into the final third. Turan played deeper and contributed more to build-up play, combining nicely with Diego. Atletico also did well to initially press Bielsa’s sides at the start of moves, breaking up their build-up play from the back. Athletic needed to change their gameplan, and despite the fact that Athletic didn’t get back into the game in terms of goals, Bielsa’s first change worked well. He made two substitutions – the first was a straight swap, with Iturraspe (who didn’t offer forward drive and was too slow on the ball) replaced with Inigo Perez. The second change was more important – Jon Aurtenetxe departed, with the highly versatile Oscar De Marcos going to left-back. Muniain moved to the centre of midfield in De Marcos’ previous role, and Ibai Gomez was on down the left. This demonstrated that Bielsa thought Athletic were far too vertical in the centre of midfield when attacking, with both Herrera and De Marcos driving directly towards goal. Muniain, who plays as a central winger when in the middle of the pitch, was allowed to drift wide to the channels and create overloads with the wingers, who also stayed wider in the second half and stretched the play (of course, it also helped that Gomez does this more naturally than Muniain; Susaeta simply change his role). Within a minute Muniain had moved wide and forced a corner, although this was on a mini-break and thereafter with Atletico sitting deep, this was less of a possibility as Muniain was making runs in front of the Atletico side, where they could watch him closely. 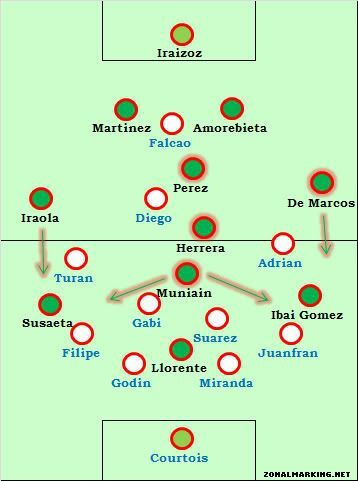 Simeone didn’t bother to change his system, as Athletic were using roughly the same formation. His next move was more desperate – the hard-working but technically limited Gaizka Toquero replaced Herrera, which meant Muniain moving deeper and playing as the ‘second’ midfielder in a two, while Toquero went upfront alongside Llorente. Consequently, Atletico were robbed of their spare man, so Suarez became the game’s key player – dropping in to become an additional centre-back to create a 3 v 2 at the back when Athletic got the ball wide, but then moving forward into midfield to make a 3 v 2 in midfield when Atletico had spells of possession, helping the slow the tempo of the game. He made a lot of clearances, and if Falcao was the star of the first half, Suarez was the star of the second – though the glory went to Diego, with an excellent third on the counter. Often the tactics play a big part in the scoreline – here, the scoreline played a big part in the tactics. Atletico’s approach changed dramatically but fluently once they had gone 1-0 up, as if that had been part of their gameplan all along and had been drilled on how to adjust. Ultimately Athletic couldn’t find a way through. Bielsa’s sides never score enough goals for their dominance of possession, and tonight was a great example of how easier it is to break down a disorganised, recovering defence, rather than one with structure and balance. Simeone’s happiness with his formation and shape were summed up by the fact he didn’t use the bench until the 88th minute, when Atletico were already 3-0 up. The final word must be on Falcao – tonight was a masterclass in how to play the lone striker role in a counter-attacking side – he was ruthless in the penalty box, but also clever with his movement and the manner with which he received the ball, always on the run towards goal. Hi ZM, Reactive sides have been successful this season. Is this the end of the mini era of Barca-style passing and pressing? 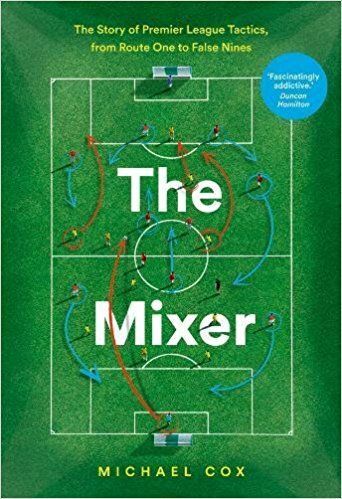 Spaces left in behind a team like Bilbao and Barca offer the most clear cut chances when exploited on the counter attack, and therefore reactive football seems to be the most efficient way to create the clearest chances? Bayern are in the CL final and may yet win with the closest thing to Barca insofar as ball dominance is concerned. Not to mention Juventus winning Serie A with a side which I wouldn’t really call “reactive.” Manchester City, for all their frustrating traits are not so much a super-expensive smash-and-grab side either. That’s right Juventus have 60%-70% possession per match. But Juve are a very reactive side, in terms of the formation battle. Against the likes of 3-man defence teams such as Napoli or Udinese, Conte also reacted by playing 3 defenders. In fact, Juventus was probably the most adaptive team in Europe, that most changed formations game-to-game, looking to keep a spare man at all times in defence. But of course, they chose a possession style of football. Juve were reactive in terms of their formation, rather than their play. Changing to a back 3 to match the opposition’s shape didn’t stop them from enjoying the bulk of possession in those games. @Alican I agree with you.But Conte played only one formation 3-5-2 in the last 10 games.This means that he found his formation and there is no need to swtich from 4-3-3 to 3-5-2.And I think that’s why he was changing so often his formation(he was trying to find his optimal formation,and for now it is 3-5-2). Juventus, despite their dabbling with 4-4-2, 4-3-3, and 3-5-2 over the course of the season in part to suit opponents, in part to suit their own players are a team that are fundamentally looking to control the tempo of a match. They are not about absorbing pressure and nicking the ball into gaps that arise on transitions (not that they don’t do this, but it isn’t the key to their game). They look to dictate tempo (as pretty much any side with Pirlo would), control possession, and overwhelm a defence. The fact that they sometimes change how they line-up doesn’t make them reactive in any negative sense. If we just mean reactive as in malleable in terms of formation/personnel/minor stylistic preferences than all great sides today would pretty much fit the bill, especially Barca (even the False 9 role could be construed as the height of reactivity since you are using a forward to play in midfield and thus adapting in game, even though the real purpose is to create space for inverted wingers, onrushing midfielders, and dominate tempo). Formation battle is simply overrated. For example, for Juve, playing Chiellini at LB in a 4-3-3 or 3-5-2 doesn’t change the way the left side of the defence works. The fulcrum of the side (Pirlo, and to a lesser extent the effective-allrounder Marchisio-Vidal duo) remains constant, as well as the energetic presence of Lichsteiner on the right. And if Barca play 4-3-3 or 3-4-3 they are still in the same style and are looking to dominate proceedings regardless, and are vastly different to say Chelsea’s 4-3-3 or the 3-4-3 Hiddink used with South Korea. Especially when you see that one of the dominant systems today, and one whose specific mechanisms are used elsewhere as well (i.e. in 4-4-2 and 4-2-3-1) the 4-3-3 with a midfield anchorman dropping deeper, fullbacks bombing on, and wingers pushing in shouldn’t be branded reactive (even if in another sense it is) because it adapts to the change in ball possession, but rather as a proactive attempt to force a side’s will on the opponent by maximizing width and attempting to overload a part (usually not done in whole, since this is very tiring, stretches passing distances and prevents ball retention, and creates vulnerability to the reactive counter-attacker) of the defence. I agree,Conte has said that the only constant thing in his formations-is the trio-Pirlo,Vidal,Marchisio). It depends on whether Tito Vilanova continues with the Guardiola vision, cant wait for Guardiola to return to the game, hopefully in England. Check out http://www.theirtactics.com its the only other soccer tactics website that can be put in the same league with ZM. I’m very surprised Bielsa didn’t take off Amorebieta for Ibai Gomez instead of Aurtenetxe, who is capable of playing centre-back. The former was truly awful, was carrying an injury and was misplacing almost all of his long passes. 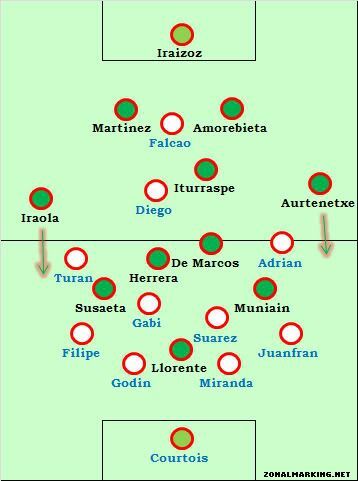 Perhaps Bielsa didn’t trust Aurtenetxe at centre back, however I’m sure he could’ve done a better job than Amorebieta. Another point is how uninspired Athletic looked at times. Perhaps I’m expecting too much and while it’s true that a lot of them must be knackered by now, but Muniain and Ibai for me were the only stand-out performers from Bilbao, which is funny considering all the focus on experience, which in my opinion is mostly irrelevant. Muniain showed in his performance today that experience is null and void when you have the hunger and determination to succeed (although he didn’t, sadly). Amorebieta sure had a bad game but that doesn’t warrant an immediate substitution, its really risky to make a changes to your CD dua in the middle of the game, everybodys knows it.The whole team was really weak defensively and thats where there problems started, Bilbao had a very nervy game with punch of mistakes all around the field.And his poor long passing isn’t sure the reason to take him off, its not his job, he has Martinez next to him, who should be great at it. Muniain is a great player and definetly had his share of time on the ball today, but wouldn’t say he stood out with anything, he made a lot of mistakes and was predictable as was the whole team. To me the best perfomance came from De Marcos but he just played one half. 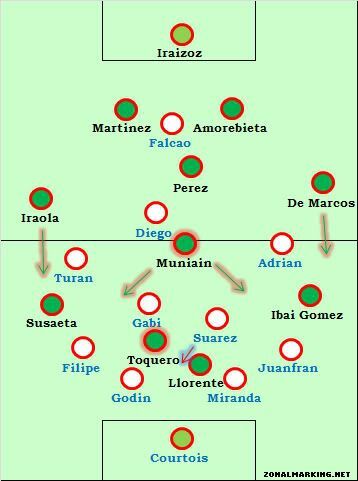 You’ve put Muniain in twice in the diagrams, instead of Susaeta. Falcao was superb. Made Javi Martinez look poor. Great article and a great game between too technically good sides. - Courtois was fantastic in goal and kept Atletico from conceding at important moments. - As ZM said, Suarez broke up play excellently, especially as Athletic tended to build up in his side of the pitch. Then again as ZM noted he played an important role when Athletic put two up front, as Atletico looked vulnerable at the back and his positioning was excellent in covering for the two CB’s. - His partner was equally good, Gabi. He consistently moved the ball forward for counter attacks and his technical ability meant he wasn’t as susceptible to Athletics pressing game. - Falcao was fantastic up front, able to drop deep and hold up the ball, allowing the wide players and diego to get forward. He also had the technical ability to play some great passes on the break and his finishing was lethal. Was one of the best games I have seen him in. - Special mention should go to Diego and Turan as well, Diego easily had the beating of Iturraspe on the break and Turan tracked Iraola all game, not easy to do and it kept one of Athletics best players quiet. Athletic have been looking towards the Copa final against Barca for a long time. They were happy to be in this final, and a counter-attacking team like Simeone’s Atletico are always Bielsa’s undoing. Shades of Brazil-Chile in South Africa. Same scoreline. Disagree, surely they had a better chance of winning this one than Pep’s farewell match. This Euro tournament is what’s put them on the map, I reckon they would have wanted this one more. At the end they looked pretty upset. Iturraspe should of made runs from deep. Runs from defensive midfielders are very hard to stop since attacking midfielders don’t know whether to follow them back to the edge of their own area or leave them. bilbao had a really off day, especially amorrebieta. they were alot better when they beat united. The Arouca role, as ZM would love to call it. It’s not easier, just quicker. And maybe slightly less expensive. Simeone played for Bielsa in 2002, I wonder if that experience informed his appraoch here? Seems like the positions you gave to the A. Madrid players are a bit off ZM. In the pre-match line up, it was widely recognised that both teams would line up 4231. Bilbao, from the begining, played in a very similar way that we have seen Barca play all this time, pushing the fullbacks on like wingers and having one holding mid drop in, to fill the hole created by the center backs going wide. It was clear from the very begining that Madrid were pressing much harder than Bilbao liked and gave them no time on the ball at all. They achieved a more intense high press by simply rotating the central midfield triangle to make a 4141. Without the ability to play football from the back, Bilbao were shell shocked from the very begining and Madrid managed to take advantage and take the lead (from a great performance by Falcao) not once but twice in the openning exchanges. I would then say Bilbao looked like they didn’t have a plan B, although they did make a few chances, they appeared throughout the game to be more contained by Madrid than vice-versa. It was a very enjoyable game and really not truely over until the third goal, as you wondered whether Madrid’s energy would waver towards the end, it didn’t. Conclusion, Madrid wanted it more and Bilboa were maybe in fear of failure before it even started. Also, Falcao, can’t be staying put much longer, he was amazing. Athletic are not a top side and it really showed. This is a collection of a few talented players (Llorente, Muniain and Javi Martinez) and a bunch of semi-talented players…. none of the really up to the level of that trio. Bielsa deserves great credit for taking such an underwhelming side to a final, playing some appealing football. A more cautious approach from Athletic would, perhaps, have been more fruitful. But Bielsa is Bielsa, always true to his style. The same could be said for nearly every team in the world,we usually forget that you could not have 11 star players at the same time. Athletico Madrid is normally called “Athletico” rather than “Madrid”, if only to avoid confusion with another Madrid club… I guess “Bilbao” instead of “Athletic”, OTOH, would have avoided some confusion. Real Madrid is out of context in this article, so your point about it fails. ZM, this match was a clear example of how a moment of individual brilliance can change the whole scenario. It was evident, Bilbao didnt turn up well in this game, except for the last 20/40 minutes. And in the beginning of the match, they tooked really off, absurdly off for a side who excelled till now in the tournament. And then Falcaos goal changed everything. From there, it was quite sure Atletico will just look for counters. Even in a normal game, Bilbao often leaves lot of space at their area for the opposition and Simeone knew this and he must have been delighted with that first goal, which was the match winner. Almost all players including Muniain had a very bad first half to add to their vows. They did looked like the real Bilbao in the second half, but Simeons’ side knew how to defend. I really hope Bielsa and all his players stays for the next season as well. We can only expect huge improvements from this team. Experience was the crucial factor in this game. Athletic collapsed under the pressure due to inexperience and handed it to Atletico, who seemed more concentrated by their usual standards. It’s a pity as i really wanted Athletic to win this. “tonight was a masterclass” on how to get off with kicking the opposition goalie in the cods. Shades of Suarez – fine footballer, loathsome character. Which Madrid player created the space for Falcao’s 1-0? No-one did, the defender blocking him slipped. It was a combination of Falcao’s brilliance and Athletic giving the ball away during a defensive phase. Which they repeated for his second goal. They looked a bit tentative in possession in the 1st half. I think it was Adrián Lopez, though not 100% sure! i have heard bielsa talks about tactics on great length but it seems that he never had a plan B . which was more so required . as an offensive coach just like gaurdiola bielsa is very good but looking at the defensive qualities of his makes me wonder . now about the game when you are playing against side which is keen is there are certain flaws like the team which is pressed if it can wriggle out say win a one on one situation when pressed or can hold the ball and play around the player then the whole defense gets opened ( it is true even on any defensive system ) and then the team scramble to fill spaces and it can be exploited which athletico madrid to the fullest . now about athleticos tactics they have a young team they press the ball but can be played around to be honest let me tell you i thought that yesterdays defeat was more of bielsa rather than athletico . he didnt had a plan b . bielsa that drilled them to play a good floor game play those small triangles play around the opposition when going forward . yesterday i dont what were they trying to achieve they tried to open the flanks particularly the left one but i couldnt understand as what was their objective trying to get to the byline or throwing crosses which they didnt do . i dont know but why didnt he tried to change llorente’s position after the half time asking him to play him on the shoulder of last defender where on he was tightly marked bielsa could had asked to come deeper and release munian . most importantly yesterday unlike other times when i watched them athletico players spent too much time on the ball didnt pass around ( credit to A.madrid they denied space ) and this is where he could had checked his players and told them to release the ball early the second goal was a result of that . most importantly he need to work on his players and their defensive side and most importantly the centre backs they dont know how to defend most importantly organise the defense when they loose not just go on pressing and get open you could see the gap between the defensive line and the midfield where on A. madrid could play around the midfield players and then bring the wide players in to play who stretched it properly . bielsa need to get his defensive shape correct because against a better teams who can play good floor game they will struggle . now about athletico madrids tactics they just sat deep and if you can see one of the individual ( mouranne moussa ) made a very good observation that the distance between midfield and defense was very narrow which didnt allow llorente any space also it didnt allow minuan or any other to get played around . secondly credit should go to midranda and gabi not only did they defended perfectly but they bought the ball out of the defense very nicely and spread it around initially i though that they wanted to slow the game but while going forward they played it with purpose . i think simione has worked with players on individual basis since you can see from their performances likes of turan , adrian and even suarez and gabi seems to prosper . Athletic Bilbao have been the darlings of the entire European season – but it looks like they won’t get into any European competition next year, which is obviously a shame. “Athletic Bilbao have been the darlings of the entire European season”: they’d certainly become mine. Ah well. Actually, Athletic will play in the Europa League again next season due to reaching the Spanish Cup Final against Barcelona. With Barcelona grabbing a Champions League ticket, Athletic will automatically receive the Copa del Rey ticket. After seeing this match and the way Bielsas side played, I think it’s such a shame that he didn’t become the Barcelona head coach. He would’ve been awesome there. weak nerves and shambolic defending from bilbao, who lost the game in the first 10 minutes. they never settled down, and i am not sure much of that could be credited to athletico, because yes, they were disciplined, compact, and covered the spaces well, but it wasn’T as if their tackling and pressing had been really brilliant. not that they needed to be, with the kind of passing and errors from bilbao. that first goal was delicious, and was the nightmare scenario for bilbao, which could have been worsened only by the 2nd goal, which duly came just as they were starting to look a bit more like themselves. at 2-0 down, i honestly had no idea what bielsa could do. they had to take even more risks but given their defending, meant that athletico were always going to threaten going forward. as it was, it was atletico who got the third, not bilbao, though bilbao had the chances. summed up their night, really. i felt that the first goal changed the game. it allowed atletico to sit back and punish the bilbao mistakes (which were plenty), and they thrive on this. from that point on, it was honestly hard to see bilbao coming back. they didnt play to their potential. bielsa’s 2 subs at half-time worked well, as you mentioned, and addressed some of the issues in the first half. their no8 was awful. the attackers were trying to run forward too much. they forgot their own basics: sometimes to go forward, you have to go backwards. regarding atletico’s sitting back, i feel there are only two clear solutions: long balls (never going to work with their wayward passing last night) and even more movement and passing. i wonder if the pitch did affect their passing and movement as well? The ideal to move Muniain into centre is still to be prove. His decision whether to pass or to dribble , was fairly poor yesterday night , though it is understandable that he is not a nature AMC. Moving Martinez to CB as a extra man may help to build the attack but on the other hand they took the strongest tackler from the midfield line and leave with no protection , when Bilbao unable to control the game (like last night , too many passes intercepted by A.Madrid) . Their midfield could be easily tear off as Iturraspe is a pivot / holding midfield rather than a ball winner / DMC / someone able to protect the DF-line. Rather than tactical factors , i would say they were never in the game , both when they were with the ball and without it. Bilbao never showed enough passion and movement also they were very careless on their passing in the first half . Lack of patience , too rush , often tried to make a killer pass which didn’t worked. It only looked a slightly better after Toqeuro came in , given a extra player in the box. They had a few chance in between 70-76 mins but all just came so close. Herrera and Amorrebieta both had a bad game. I think Falcao is an interesting player. He obviously is a very good goal scorer, excellent in the air and has great anticipation, while not being especially gifted technially, athletically or tactically. But it’s interesting how players like him make the most of what they have to become good players notheless. 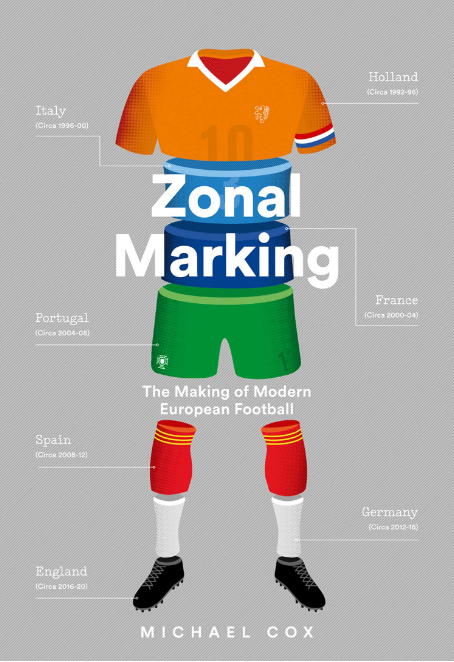 ZM, could you please do a ‘Season in Review’ article like you did for the 2009-10 season where you dissected overall trends, the best league, best performance, best matches, etc. ? If working for the Guardian and ESPN means no more time for zonalmarking.net (and two days after a fairly exciting finish to the EPL season with no new posts heremakes me suspect that is the case), well, I’ll try to be happy for you because of your success going mainstream, but I’ll also be sad because this was an amazing site. Woah, hang on. I’ve spent the past two days planning my Euro 2012 previews, which are going to be fairly comprehensive and I’m also going to cover the tournament in-depth. As much as the final day of the season was great, it wasn’t a particularly ‘tactical’ thing, it was just something to enjoy – which is what I did and I hope you did too. What would you want me to write, realistically? It’s not really about ‘going mainstream’. It’s about earning a living. If I wasn’t doing that, I wouldn’t have any money – I’d have to get another job and therefore I wouldn’t have any time to do the site. Slightly offended you see it like that – doing stuff for Guardian and ESPN etc allows me to do the site, it’s not taking away from it. Tamudo goal will be extremely controversial.